At 2:45 p.m., on May 24, 1942, 2nd Lt. Charles Jaslow was attempting to take off from Bradley Field. 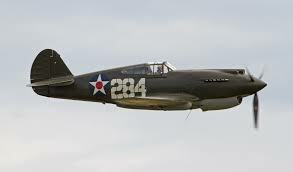 Just as his aircraft, a P-40E, (Ser. No. 40-396), left the ground, it was struck by a cross wind and pushed towards a mound of dirt at a construction area just to the side of the runway. His plane’s landing gear struck near the top of the mound and was torn away. The plane then hit the ground and skidded to a stop, but did not catch fire. Fortunately Lt. Jaslow didn’t suffer any serious injuries. Lt. Jaslow was assigned to the 65th Pursuit Squadron, 57th Pursuit Group.